The day is very near. 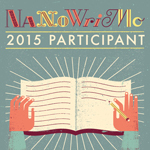 Another year of NaNoWriMo. Big changes ahead for me this year. Maybe. Unless my characters revolt. More to come on my 2015 process. But, first, I have a show to interpret (the Broadway-bound, home-grown musical, "Cuba Libre" - creatied and produced by Artists Repertory Theatre). And a few more decisions to be made about my plan. I will let you in on a few secrets. Later. Not now. Or maybe you'll have to catch them on the fly with me. November is going to be a very busy month. With NaNoWriting and Theatre and ... It's all good. Living the creative life.